Now, the first thing that we're going to do is to create a sample module, something that will allow us to work through the scaffolding of a typical module and also help illustrate the fact that if you are working within Hooks there is a lot that you can do in Drupal using the existing skills that you have that you've built working with Drupal 7 or Drupal 6. So let's head over to our Resource Pack and here you should see a glue folder. You will also see a number of other folders here but those will be added as we progress through the series. You'll see them in the Resource Pack now though so don't worry about them too much at the moment. Now, let's open up our Drupal installation in a separate tab here so now we can easily switch back and forth between our Resource Pack and our Drupal installation. Now, in previous versions of Drupal, we would end up putting our custom modules in the sites all modules folder. But in Drupal 8, things get a little bit more intuitive and now you can put modules directly in the modules folder in the base directory of the Drupal site. So what we'll do is go to our Resource Pack and we'll copy the glue folder. 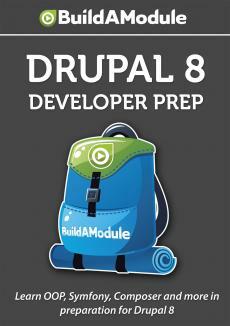 We'll jump over to our Drupal installation, open up the modules folder, and paste it in.